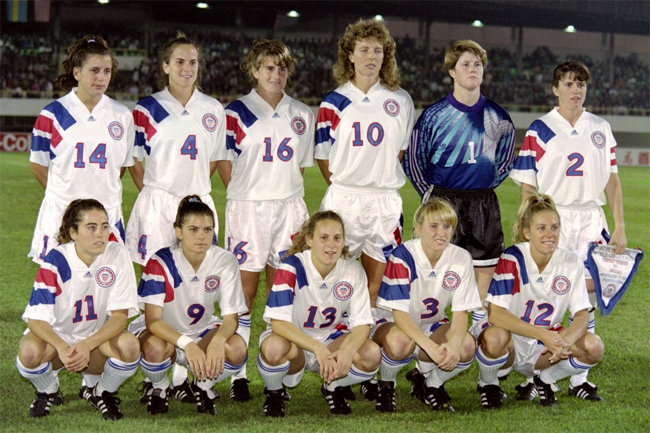 The United States was the dominant team of the early years of international women’s soccer, but it didn’t go into the first Women’s World Cup, in 1991, as the favorite. There was no favorite. Nobody really knew what to expect at that point. That changed on Nov. 24, 1991, when the United States beat Taiwan by 7-0 in the quarterfinals, in Foshan, China. That was the night when the U.S. women announced to the world that this nation that was a traditional doormat in men’s soccer was going to be a power in the women’s game. It also was the night when Michelle Akers stamped herself as the greatest female soccer player in the world, perhaps of all time. Before this game, there were three contenders for that honor: Akers, Heidi Mohr of Germany, and Carolina Morace of Italy. After Akers’ five-goal performance in this game, there was no longer any doubt. Even before this game, the United States had been establishing a very good record in this World Cup. It had swept through qualifying undefeated and then had done the same in its first-round group, beating Sweden, Brazil, and Japan. There had been some worrisome defensive slip-ups against Sweden, however, and some of the other teams were looking strong as well. Officially, the United States’opponent in this quarterfinal was called “Chinese Taipei” as a result of some semantic sleight-of-hand in international sports 10 years earlier that allowed the International Olympic Committee to admit China to the Olympics without ousting Taiwan. China felt that Taiwan was not really a separate nation and was still hoping to annex it some day. The best of Akers’ five goals may have been the last, a diving header just inside the near post after a free kick from the left by Shannon Higgins. The last of her three first-half goals also was a beauty, as she picked the corner of the net after the ball had been punched out to her by the goalkeeper. Akers’ goals raised her total in this tournament to eight in four games, a total that later reached 10 in six games. The other American goals on this night were scored by Joy Biefeld (who later became Joy Fawcett) and Julie Foudy. The other blades of the Americans’ “triple-edged sword” in this tournament, April Heinrichs and Caren Jennings, were held scoreless in this game, but Jennings scored six and Heinrichs four in other games. Over the years, the United States women certainly have scored victories more famous than this one, including the one six days later when they won the first Women’s World Cup by beating Norway in the final. This one was a vital stepping stone, however. A version of this article was originally posted on the BigSoccer.com website in July 2012.